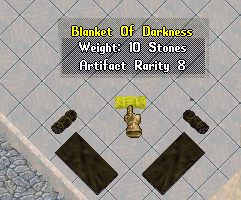 The Blanket of Darkness is a fully functional artifact bedroll. While it spawns rolled-up facing southeast, its appearance can be changed by rolling it out on the floor and back in (double click) various times. The Blanket of Darkness can be stolen inside dungeon Wrong. It has a rarity of 8 and therefore spawns approximately every 8 days. A minimum of 100 (Grand Master) stealing skill is required. Its spawning on the entrance level inside one of two certain prison cells. The Blanket of Darkness gives 750 Clean Up Britannia (2011) points. Upon roll-out early versions lost their artifact tag and their weight dropped to 5 Stones. While they still exist, the bug was fixed.